Inside Scoop: Ever wondered how to clean out your digestive system naturally without the harsh side effects of pills, liquids or powders? Here are the top 10 daily habits to follow for detoxing through better digestion. Did you know that the National Institute of Diabetes, Digestive & Kidney Disease (NIDDK) reports that in the U.S. over 60 million people are affected by chronic constipation, and nearly 15 million people are affected by IBS? But digestive disorders and diseases aren’t just chronicled by whether or not you are regular. We often mistake chronic gas, bloating, GERD, cramps, or irregularity after a large meal as being totally normal, when in reality it’s not always the case. Chronic symptoms can be the result of a bigger picture, and chronic gastrointestinal distress can 100% get in the way your body was designed to detox. However, don’t be scared if you have the occasional bout of diarrhea, or gas. These symptoms are also very common for the human body, but it doesn’t hurt to know how to improve your digestion for better health, understand the impact that diet and digestion have on detoxing, as well as how to clean out your digestive system and naturally care for your chronic digestive disorder. Did you know the gut hosts nearly 70% of our immune system. It also contains an incredibly unique microbiome that consists of nearly 40 trillion bacteria! Your healthy gut bacteria play a massive role in the overall wellness of your G.I. system (as well as the overall wellness of your entire being). They’re responsible for fighting bad bacteria, for breaking down food particles, and for fighting disease. But don’t be fooled, these good bacteria live in conjunction with disease causing bacteria, ‘the battle of good vs. bad’, and if the bad guys end up growing large colonies and proliferating, your internal ecosystem gets thrown off entirely. These bacteria can be directly affected by the food you eat, and over the years research has started to prove just how important diet is for the overall health and well-being of your gut. It’s sad to say that the way North America has become accustomed to eating has grossly impacted the health of our microbiome, leading to a whole host of health issues, impacting our body’s synergy and completely jeopardizing our detox organs. If you find that you’re experiencing some of these symptoms, and know something might be off with your digestion, there’s a chance your detox organs aren’t working efficiently either. Okay, we’re going to keep this as simple as we can, because we really don’t want to bore you. Understanding how our bodies properly detox and how to clean out your digestive system naturally comes from a place of understanding how digestion works, and how our gut health, and the food we eat has a direct impact on most of our body systems. You eat food, the chewing and saliva release enzymes that break down starches, and this is where digestion starts. 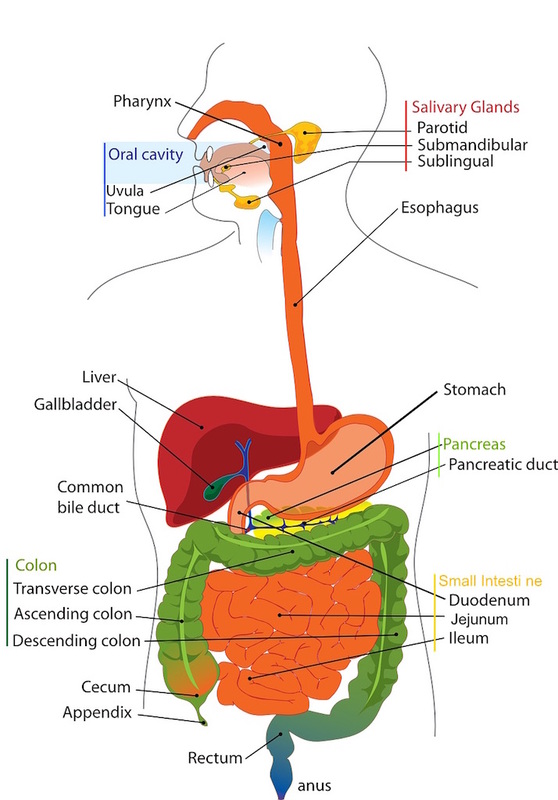 The food travels down your esophagus into your stomach, which acts as a storage tank (because you can’t throw all the food from your meal straight into your intestines), stomach acid and some enzymes help break the food further, but this is not where most of your food gets digested and absorbed. The food slowly enters your small intestine where bacteria and microvilli digest/ breakdown food particles and absorb nutrients. Your pancreas releases digestive enzymes to further break down the food. Your liver produces bile and sends to the gallbladder, where the gallbladder releases bile to further break down foods (mostly fats). After everything is digested, absorbed and processed by the small intestine, pancreas, gallbladder and liver, the food particles (indigestible substances) pass into the large intestine where excretion happens in order to remove toxic by-products and indigestible fibers. In addition, the large intestine hosts the largest gut flora population that produces some important vitamins like vitamin K and biotin. While, doctors say that it is completely normal to only use the bathroom 3x a week and anything less would qualify as constipation, you can see that any nutritional practitioner would say that elimination needs to happen daily in order to prevent toxic byproducts from remaining in the large intestine. Not only that, but when things aren’t running smoothly, or one piece of the digestive process isn’t functioning properly other areas of the digestive process suffer, as well as other detoxification pathways. For example, if you have a compromised gut from years of chronic constipation, you may be experiencing leaky gut. Leaky gut is a common theory that the lining of the small intestine becomes damaged, creating space for large food particles and proteins to enter the blood stream. Since it’s not normal biology for these particles to be in your bloodstream, your body recognizes them as foreign invaders, causing an immune or allergic reactions to them. The immune response can potentially result in widespread and systemic inflammation, ultimately putting added stress on your cardiovascular system, your liver and your kidneys, and this can have a direct impact on the way you digest and absorb food. The good news is that most people who visit us for chronic constipation or other chronic digestive issues (without being diagnosed with IBD) will find huge relief with some simple dietary changes. While managing your digestive issues through proper dietary measures is definitely recommended, it’s also important to understand that there are foods and lifestyle habits which can negatively impact our gut, and our detox processes. 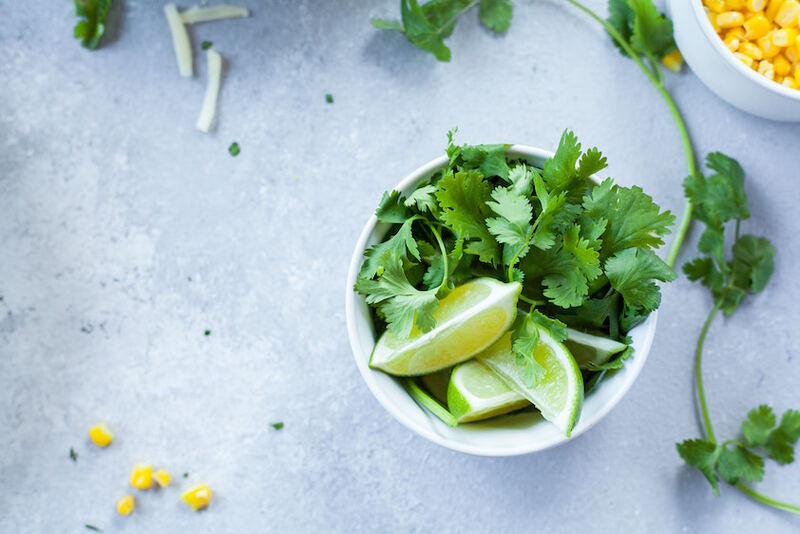 Limiting these foods is just a first step to improved digestion, but check out our top 10 tips on how to how to clean out your digestive system naturally to help heal your gut and create a healthy space for elimination and detoxification. We all know we need to drink plenty of water. But did you know that having a glass of warm water in the morning with lemon before eating, and drinking water 15 minutes before meals with get your digestive juices flowing and your food will get digested better. Check out our 5 Simple Tips To Get More Water Into Your Life. *Remember to use a straw to protect your teeth. Fiber is needed to carry those undigested food particles through your lower intestine to be eliminated. In most cases, clients who increase fiber consumption, alongside plenty of water, see an increase in regularity. Increasing your veggie and fruit intake is a great start, and you can also try this: 1-2 tsp of chia seeds in a glass of water daily, as a wonderful stool eliminator. To elaborate on our above point, an excess in refined carbs and sugar feed our unwanted gut bacteria, and can contribute to a gut imbalance. They also spike blood sugars, causing the craving for more sugar, and a vicious cycle of carb/ sugar bingeing, which can lead to poor dietary choices and weight gain. Taking a short fasting period, 4-6 hours between daily meals allows your body to digest and assimilate your food. When your gut is constantly bombarded by food all day long, it doesn’t work optimally. Give it some time to work on that last meal before you head to the kitchen for a snack. Naturally fermented foods such as kefir, sauerkraut, pickles, kimchi, miso and tempeh help feed your healthy gut bacteria and create more homeostasis between your gut biology. While there’re no base in science for strict food combining, and many foods contain a combination of macronutrients, this can still be a helpful strategy for anyone with severe digestive issues. Just think of it this way, when you eat a variety of different foods in one meal, you’re putting a bigger strain on your digestive system. Just imagine a creamy carbonara pasta with chicken followed by a chocolate cake for dessert. Would you have felt lighter if you had the pasta with some veggies and a tomato sauce and skipped dessert or had it 2-3 hours later? Most likely, yes! To combine food, you eat animal protein with vegetables and grains with vegetables, but you wouldn’t combine grains with meats. Also, a good practice is to eat dessert or fruits a few hours away from meals. These guidelines are to eat until you are 80% full. That leaves 20% of the room left in your stomach for your digestion to work. No one likes that uncomfortable full feeling and your tummy will thank you if you stop just before you are full. And, if you wait those 20-30min, you will probably feel full as it takes time for our satiety hormones and brain to register that we’re full. If you notice that you have undigested food in your stool, digestive issues or gas/ cramps and bloating, this concoction is a wonderful gut loving supplemental protocol. Enzymes help to break down the food, probiotics help to reestablish healthy gut bacteria, and bitters help release digestive and gastric juices. Download our Supplement Guide to see our top recommended gut loving brands. Bone broth is a soothing and healing drink. Homemade bone broth contains plenty of minerals and nutrients, as well as proteins, such as glutamine, that assist with cellular turnover in the gut, helping it to heal faster. Not only is bone broth great for your gut, but soups and smoothies are also wonderful additions to the diet as gut loving meals. Because they are already pureed, your body doesn’t need to go to the extra work of chewing and breaking them down, making them much easier for your body to digest. This might not be a food aspect, but stress has a direct impact on our digestive system. You’ve heard the term ‘that gut feeling’? Well our brain and gut are connected on more levels than you might think. Taking stress reduction measures can help minimize your gastrointestinal symptoms. Try meditation, yoga, massage, deep breathing techniques or journaling. Also, moving your body helps increase your metabolism, so making sure you are incorporating at least 30 minutes of exercise into your daily routine will become beneficial in reducing symptoms associated with gastrointestinal issues. Stress reduction, exercise, breathing techniques, lengthening the muscles are also great ways to naturally assist your body in detoxing. These are definitely great places to start to increase overall gut function, and help support detox, naturally. If you are finding that you follow these steps, but still notice the above symptoms, or bad reactions to certain foods, it might be best to consult a doctor, or a naturopath to further examine your diet and lifestyle and come up with a plan or strategy best suited to your personal needs. How many of these tips do you follow? Comment below we would love to hear from you.